The Treasury Department slapped sanctions on Venezuelan President Nicolas Maduro Monday, sending a clear signal of the Trump administration's opposition to his regime. The move comes a day after Maduro declared a sweeping victory in a vote that will allow him to further consolidate his power over the crisis torn nation. Much of the world -- and many of Venezuela's own citizens -- have called the vote an assault on democracy. "Yesterday's illegitimate elections confirm that Maduro is a dictator who disregards the will of the Venezuelan people," said Treasury Secretary Steven Mnuchin in a statement announcing the latest sanctions on the Latin American country. Beginning on Monday, all of the Venezuelan's president's assets that are subject to U.S. jurisdiction will be frozen. All U.S. citizens are also barred from dealing with him, according to Treasury. It's unclear exactly what assets Maduro has in the U.S. Mnuchin declined to provide reporters with additional details during a White House briefing Monday afternoon. A Treasury spokesman told CNNMoney Monday's action will "impose real costs -- no U.S. person can do business with sanctioned individuals, and sanctioned individuals are denied access to the U.S. financial and commercial systems." Even when a sanctioned person doesn't have a bank account in the U.S., it often disrupts the ability to do international banking or business, he said. Maduro is one of a handful of heads of state to be sanctioned by the U.S. government. He follows in the footsteps of Syrian President Bashar al-Assad, North Korea's Supreme Leader Kim Jong Un, Zimbabwe's President Robert Mugabe, former Yugoslav President Slobodan Milosevic, and Manuel Noriega, who was a military dictator of Panama. Trump's decision to sanction Maduro is not as severe as broader economic sanctions on Venezuela's oil industry. Oil is Venezuela's primary source of income. Senior administration officials hinted Sunday that broader sanctions might be coming. Yet Mnuchin declined to comment Monday on whether the U.S. is considering further sanctions. "As we continue to monitor the situation, we will continue to review all of our options," said Mnuchin, noting the U.S. government wouldn't take any action that would hurt the Venezuelan people. Venezuelans like Monica Calderon, 30, who manages a perfume stand at a shopping mall in Caracas, called on the U.S. to "apply the sanctions and do whatever you have to do"
"They should apply them as soon as possible because we're living under a government that steals money," said Calderon, who spoke to CNN from an opposition-supported area. "It's going to send a message, because we are hoping that Venezuela isn't alone." 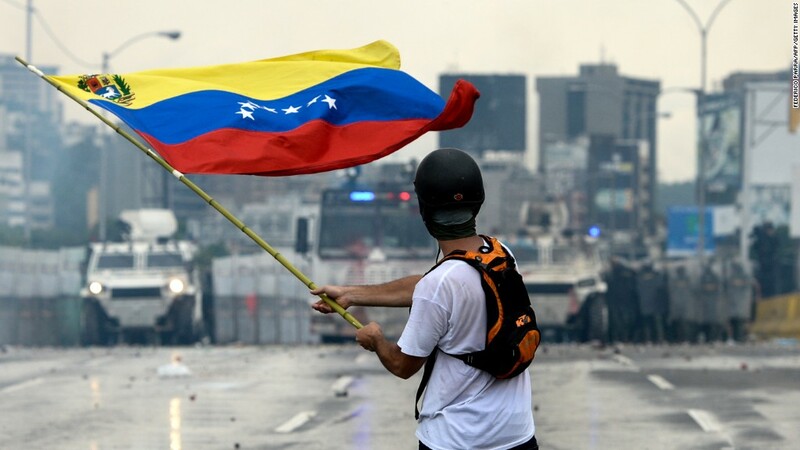 "We are in a dictatorship," Aldo Volani, 68, a security advisor who has lived in Caracas for the last 23 years, told CNN from the same area in the capital city. "I wish he [President Trump] would have done it a long time ago." Last week, the Trump administration imposed sanctions on 13 government and military officials tied to Maduro. Mexico and Colombia followed with sanctions on the same individuals.